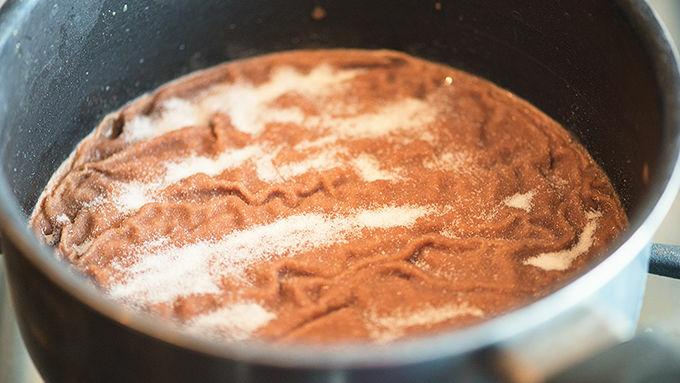 Add water and hot chocolate mix to a medium-sized sauce pan. 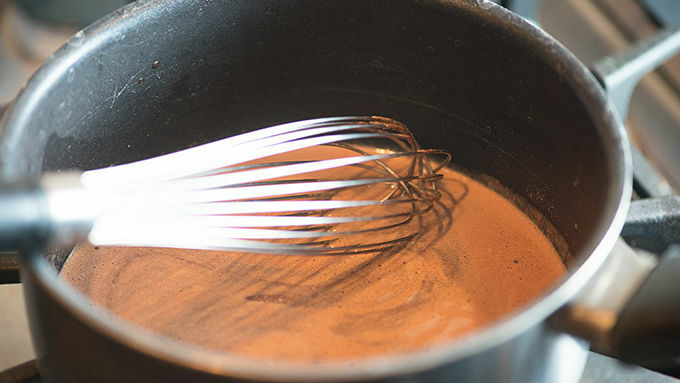 Whisk to dissolve hot chocolate. Stir in sweetened condensed milk and caramel sauce. Sprinkle gelatin over mixture and let sit for 2 minutes. Whisk mixture together and bring to a simmer over medium heat. Whisk in sugar and continue simmering for 1 minute. Remove from heat and let cool for 20 minutes. Stir in vodka and place in a large bowl. Refrigerate for 3 hours. Melt chocolate wafers in the microwave according to package directions. Work in small batches, melting just enough to fill a small squeeze bottle. 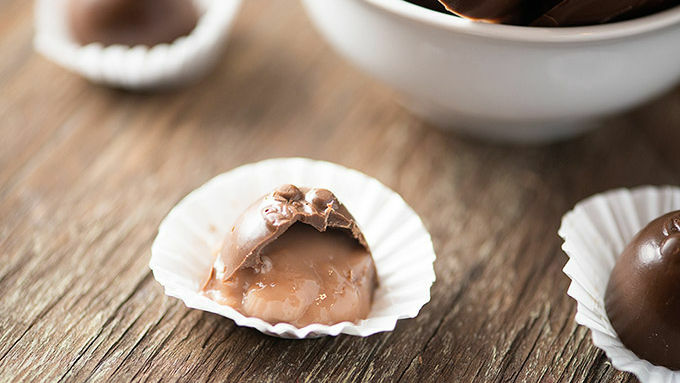 Squirt the melted chocolate into bonbon mold, covering the mold with chocolate. 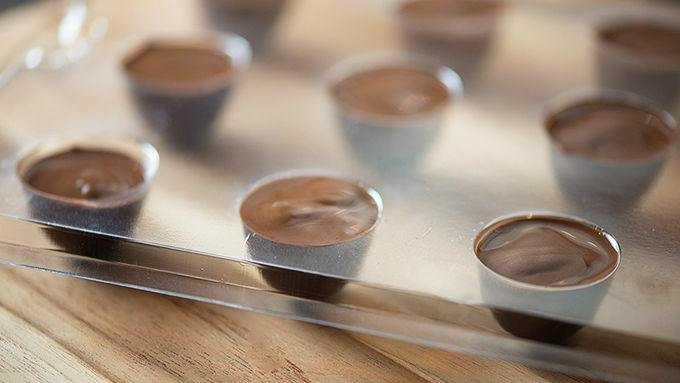 Drop 3/4 teaspoon caramel mixture into the chocolate mold. Squirt more chocolate on top to cover and fill mold. Repeat with remaining molds. Gently drop the mold on the countertop to release air bubbles. 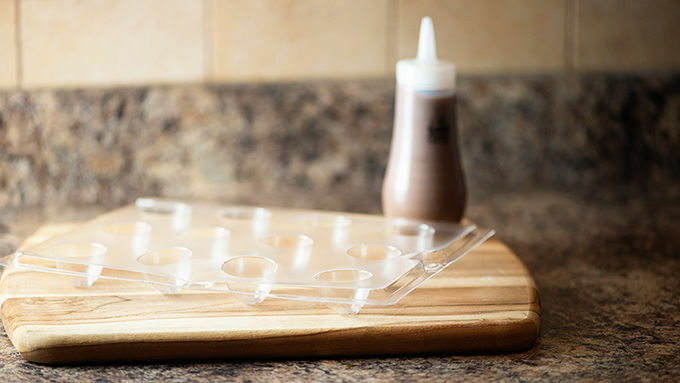 Refrigerate for at least 20 minutes before removing candies from the mold (to allow time for the gelatin to set after being warmed from the melted chocolate). Store covered in the refrigerator. Look. Sometimes you want to sit around and eat bonbons. I get that. And sometimes you want to be a little tipsy while doing so. Ain’t no shame. It’s just that we’re all so busy. There’s no time for eating and drinking all at the same time. I mean, why drink your booze when you can eat it? Why eat normal candy when you can eat special candy? You like the way I think, don’t you? Each batch of candies takes about 20 minutes, so I recommend having more than one candy mold to make things go faster. (You can certainly get by with just one, though.) You can find bonbon molds at most craft stores or online. 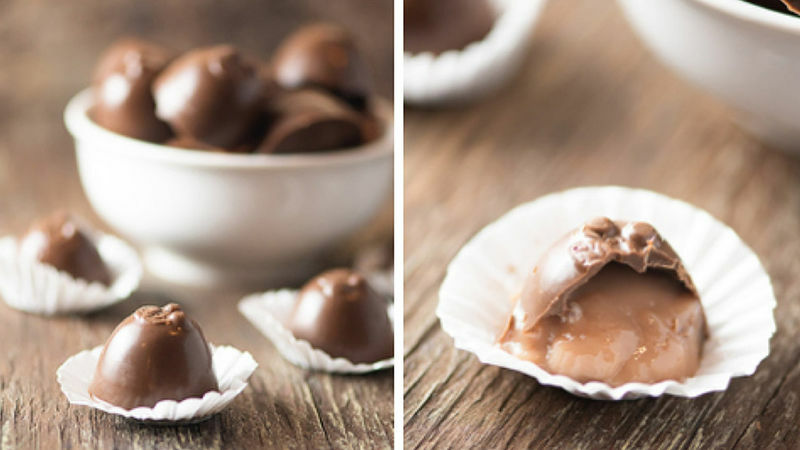 Pop the bonbons in the fridge for 20 minutes to allow the chocolate to harden and the gelatin to firm back up. The warmth of the chocolate will have melted it a bit, so be careful not to remove these too soon! Store these in the refrigerator until you’re ready to devour them!